Proceeds to be donated to two local charities: Interface Children & Family Services and RaisingHOPE, Inc.
CAMARILLO, Calif., March 29, 2017 - Semtech Corporation (Nasdaq: SMTC), a leading supplier of analog and mixed-signal semiconductors, will host its fifth annual mid-season charity golf tournament on June 16 at the River Ridge Golf Course in Oxnard, Calif. This year’s event will benefit of two foundations: Interface Children & Family Services and RaisingHOPE, Inc. Each foundation is focused on helping children and families in need of support and mentorship. Semtech Corporation, headquartered in Camarillo, Calif. since 2002, has been actively working with Ventura County to raise more awareness for its community non-profit programs. The Company has also supported other local projects including the Fox Canyon Ground Water District, Dignity Health’s St. John’s Regional Medical Center, and Startup Weekend Ventura County. To date, the charity golf tournament has raised over $135,000 for a variety of charities, including Big Brothers Big Sisters of Ventura County, Cancer Hope Foundation, Casa Pacifica, CASA of Ventura County, Interface Children & Family Services, RAIN Communities, Inc., and Relay for Life. 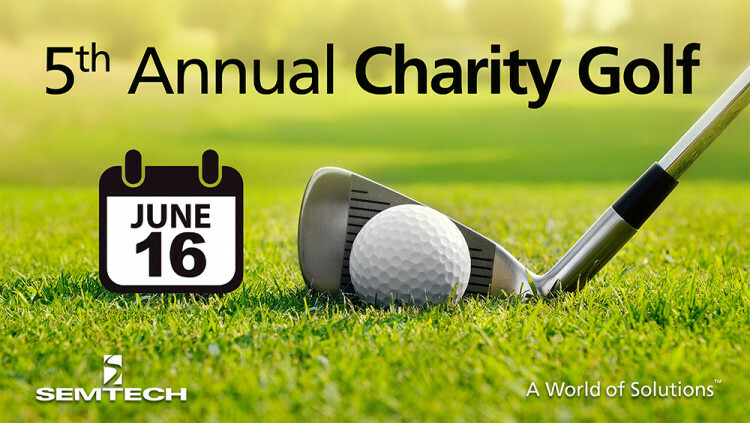 Visit the Semtech charity golf tournament’s website for additional information. RaisingHOPE, Inc. is a non-profit organization that fills the gap financially for children in foster care and those transitioning out of foster care, provides mentoring services to foster youth, and advocates for the rights of children & families in the child welfare system. Interface Children & Family Services is a non-profit social services agency, providing 24,000 local clients assistance in areas of mental health services, youth services, family violence intervention, justice-involved families, and community development.